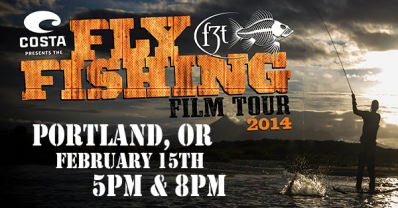 Due to the crazy storm, the Fly Fishing Film Tour's Portland Shows at the Aladdin Theater have been changed to February 15th. The show times are still 5pm and 8pm. Tickets can be purchased at the Portland Orvis Store ($13/each), along with two other locations ($13/each), online ($15/each advance), and also at the door ($15/each DOS). If you purchased tickets for the show on the 8th; they are good for the 15th show.